My daughter sometimes makes birthday cakes for her classmates. 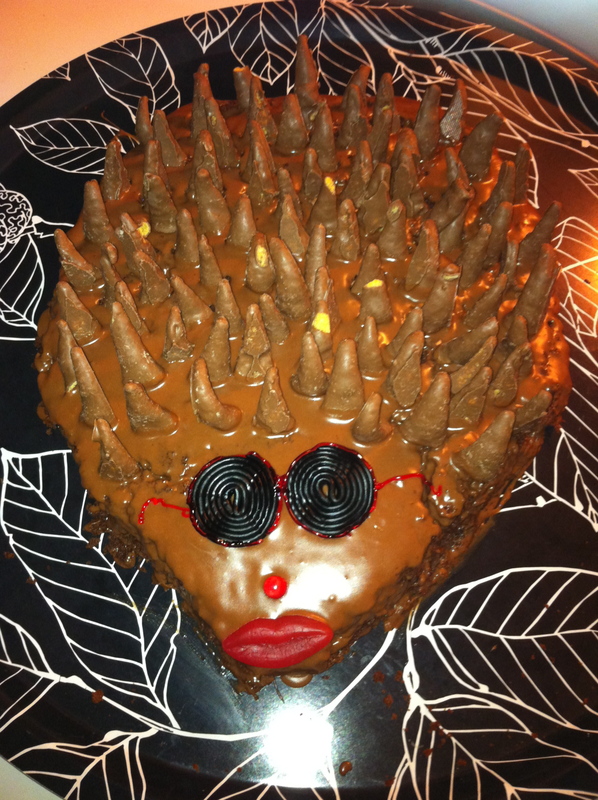 I don’t know why this one demanded a hedgehog. She did a very good electric guitar recently, a Gibson. I remember having had a guitar as a birthday cake too. It was brown, which was okay, but it was a bit out of tune. Brown is chocolate. That’s good. I love it, it’s charming! How she did it? That was a great tangue photo you took, Sig. And the tangue sent me back to Muntz (https://abadguide.wordpress.com/2009/05/10/muntz/) =) !! It’s a trade secret (though I can reveal that some bits were bought at the candy store). I’m sure she can deliver. Shares can be hedged, but hedges can’t be shared, except possibly in the derivatives market. Hedgehogs apparently take more risks than is commonly known. By the way, your reply box has taken to shrinking up when I fill out contributor details. Some programmer at wordpress has been able to pay his March bills. Yes, I’ve noticed that. It’s terribly annoying. As if the box weren’t far too small already. It’s a perfect example of what in IT is called feature creep. The section “Consequences” contains a salutary reminder for manufacturers who indulge in it:However, a more common consequence of feature creep is to produce the cancellation of the product, which almost invariably becomes more expensive than was originally intended. Possibly you should now check your wordpress bill for extra charges. What bill? I don’t pay them anything. What a horrible suggestion. If anything, they should be paying us for using their completely impractical little comments box. I suspect that my daughter is less interested in the art, and more interested in the eating.